Graham McFarlane is Lecturer in Systematic Theology at London Bible College. - Publisher Almost everyone has an opinion about Jesus, be it conscious or unconscious, rational or irrational. This clear and concise, anecdotal book encourages the reader not only to acknowledge what they believe about Jesus, but why they believe it. About "Why Do You Believe What You Believe About Jesus?" Almost everyone has an opinion about Jesus, be it conscious or unconscious, rational or irrational. 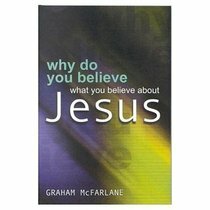 This clear and concise, anecdotal book encourages the reader not only to acknowledge what they believe about Jesus, but why they believe it.